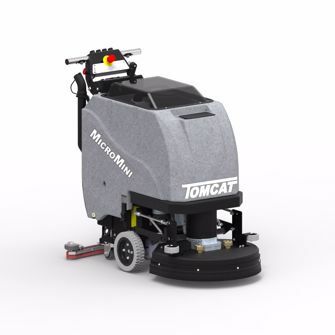 Tomcat’s MicroMini floor scrubber was designed to be simple and compact while not holding back on power with an American made motor. This commercial scrubber can clean up to 3.5 hours continuously at a maximum of 500 lbs. pressure. It would make a great addition to just about any facility – school systems, healthcare, warehouses, grocery, retail, airports – and it fits in your supplies closet! The MicroMini is available with 17” and 20” disk brush heads or 20” and 24” EDGE scrub heads. Both the disk and EDGE have polyurethane rollers to protect walls but the EDGE can strip floors without chemicals, reduces water usage by 70%, and earns LEED credits. Pad Assist – requiring some physical effort to push, the pad assist driven machines uses the scrub head to move forward. Traction Drive – includes an all-gear transaxle to help on inclines and make operating easiest for the driver. Squeegee Adjustments made with wing-nuts means you don’t need tools to maintain the squeegees! The EDGE orbital scrub head allows for chemical-free floor stripping with no swirl marks. The disk scrub head has the lowest maintenance cost and improves cleaning on uneven floors. Scrub Path Width: 17" and 20"
Dimensions (LxWxH): 42" x 21" x 39"